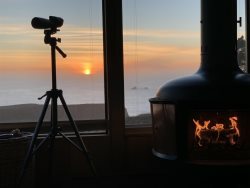 Mystic View vacation home offers sweeping Russian River views and a great escape to Jenner on the Sonoma Coast. Mystic View vacation home is located just down the road to river/kayak access, fine dining, ocean and river beaches. Area activities include beach combing, swimming, kayaking, hiking, fishing, horseback riding, surfing, wine tasting, golf and much more. "My wife and I have a lovely stay here - enjoyed the spa as well as the fireplace and movie collection. Super close to the beach and amazing view :) we'll definitely be back next time we're in Jenner." "Gorgeous views! The hot tub is perfectly positioned for relaxation of your mind, body, and soul as you gaze upon the divine natural seascape. This home offers a peaceful serene ambiance perfect for quiet reading, writing, and reflection. Jenner is a VERY small town with 1 (ONE) little gas station/store and restaurant. (Reservations seemed to be necessary several days in advance.) The closest towns are a minimum of 20 minutes away so stock up on food/drink and other necessities BEFORE arriving. Not ideal for children or young adults as there is minimal cell service (Verizon if you walked around a little) and NO free for all WiFi for continuous texting and social media. Our host Jenner is EXCELLENT with great communication! This was a perfect romantic getaway with plenty of historical and geological points of interest! We look forward to our next visit." is booked. Off the back is a fenced in area with privacy and a hot tub. great room is a hall leading to a bath, bedroom and second bath. can only accommodate the number of persons the house can sleep. I talked to Sherry and Malcolm on different matters and both were very helpful. We like the quiet and relaxing atmosphere of your property. We like the area and find it a great place to stay. Had all the info we needed in a timely fashion. We love Jenner by the sea. We have stayed at a few of the properties on this site. All are stocked with everything you need and most come with a hot tub . Really enjoyed our stay at your property. Beautiful view and really enjoyed the hot tub. Very comfortable.